While the competition bows out of the toys-to-life genre, Skylanders is finding new things for fans to buy. Today’s worldwide launch of Skylanders Battlecast adds physical trading cards to the mix. Finally folks have something to do with those Battlecast cards Activision bundled in Skylanders Superchargers last fall. Available today on iTunes, Google Play and the Amazon app store, Battlecast is a free-to-play digital trading card game. 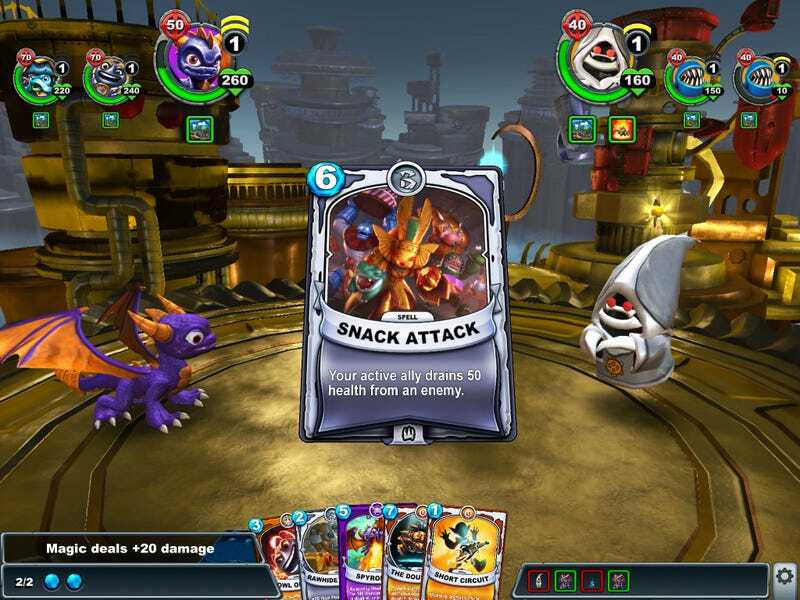 Players form decks packed with Skylanders characters and spells. Those decks are used to take on AI enemies in the game’s single-player campaign or challenges friends. While digital cards are doled out for free on a regular basis as in-game rewards, the quickest way to designing the perfect deck is to purchase all the card at your local purchase all the cards retailer. There are 300 cards to collect initially (including foil variants, because cards), purchasable in either $9.99 battle packs or $4.99 booster packs of eight cards each. I’ll be fiddling with the game over the next week. I’m a big digital card game fan, and used to collect physical card games until I realized I was going completely insane over them. This should be healthy. Here is a video of typical teens paid to look as if they are really enjoying themselves. I include this because the video thumbnail is priceless.